Spend the day touring some of the best known Scrapbooking stores in the Tri-State Area. You do the shopping and leave the driving to us. OK Barb & I went down to the NY Stationary Show and brought some really cool stuff. I have been unpacking for days and there is so much stuff that we couldn't take all the pictures fast enough. So you get a tease of all the products we have. Make sure you check our blog on the next couple of days I will be posting Angelia's Classes and information for the crop. We posted the challenge on our meetup group so I will also post it here. American Crafts is having a Spring Promo and we decided to extend it into the June challenge. Your challenge is to use American Crafts Papers,Stickers, & Shapes. During the spring promotions when you purchase 10 scrapbook papers, 2 Sticker Sheets & 1 can of shapes you will receive a gift bag from American Crafts. So we wanted our customers to benefit from this promotion and enter our challenge. You have until Friday to turn in your May challenge. We post the winner after Friday. We will have a new Circle journal in a few days, so keep checking back. Memory Expo, NJ We had so much fun, it was CRAZY. Click on the above link to see all our pictures from the show. 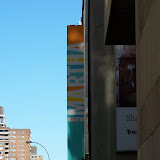 As you can see this week we went to the Martha Stewart Show as she unveiled her new scrapbook line. We had so much fun. It was amazing to see how the show went together. Barb and I (with the help of Nancy) made a gift for Martha and gave it to her, but she never showed it. It will probably be in her craft room at home. Martha gave out a scrapbook, craft knife and ribbon, Thanks Martha. Then we went to lunch at an awesome restaurant that Maria picked. Wow so much has happened since I last blogged. There was so much I couldn't say until our newsletter came out. We are adding alot to our Web site so keep checking back. Here is a quick Re-cap of what happened this past month. Well the cat is out of the bag!! We are moving!!! That was a tough secret to keep even from you guys. Sorry but we had to be sure everything was in place. Keep checking back to find out when moving day is. We are now in the top TEN of our Meetup group for the nation. There are over 200 meetup groups on meetup.com and we are in the top 10 YEAH!!! All of our members really enjoy the group. If you haven't signed up you should check it out. That is where we post all our challenge winners and announce our next project, make sure you check in. Ok Ladies, Save the date... Our next weekend crop retreat is JULY 13-15 at the Sheraton Danbury. We are going to give them another try. Next week I should have more deatils about our featured artist and MORE!!! Another thing we are working on is a Scrapbook BUS Tour in the fall so keep checking our blog for more info. This months MAY challenge is to use our newest product, Technique Tuesday, chipboard in a layout. As you know our challenges end on the last day of every month. You must bring it into the store or you can mail it in. We have alot of things going on these next couple of months. Say Tuned In for the latest news. Create Memories that Last....With us.